Does a brown, natural toothpaste sound unbelievable to you? Let’s talk about the top on my list of natural toothpaste reviews, but first, more shocking things. If you’re a parent, you’ve surely experienced the disbelief that happens when a child totally loses it over something that happens every. single. day. For the 5-and-under crowd, simple tasks like getting dressed, getting one’s hair done, washing hands before a meal, and brushing one’s teeth can suddenly be the biggest disaster that’s happened all day. It’s probably beyond his comprehension, but it makes me feel better. Why put something in your mouth that would be dangerous to swallow? It’s funny, really, that so many accept without question the warnings on conventional fluoridated toothpaste: do not swallow. Safe to eat. Rinse or swallow at your discretion. Our toothpaste in the Kimball house is brown, slimy, and doesn’t need to be spit out into the sink. It probably throws babysitters for a loop, come to think of it! It even cracks my kids up. Instead of, “Spit, please,” I try to remember to say, “Spit or swallow,” and if I don’t, they usually swallow and smile up at me. What kid doesn’t love to kind of “break the rules” and not get in trouble? I even used it as part of my cavity healing regimen! It’s called Earthpaste, and my kids prefer the lemon flavor (but the others still aren’t too “hot” for them). It makes their mouths smell a little like Pledge when you’re brushing, but it’s a good, clean smell. Lemon still has nice anti-bac properties like the original three flavors, but with less bite. I like Spearmint (because there’s no sweetener) and Cinnamon (because I just like it) and my husband is a minty fresh guy. I asked him if his teeth felt clean afterward. He realized that, by golly, they did. The peppermint and wintergreen flavors are especially refreshing – you can smell them through the cardboard shipping box! He changed a habit. Using a bit more toothpaste and brushing all over right away spread it out and seemed to make it last longer. He’s now a fan. Earthpaste does use xylitol, which is the only place I’d love to see a change. Xylitol is a sugar alcohol which I wrote about HERE, and although it’s a lot safer than many options and even might protect teeth, I’d prefer to see pure stevia in something I plan to swallow. 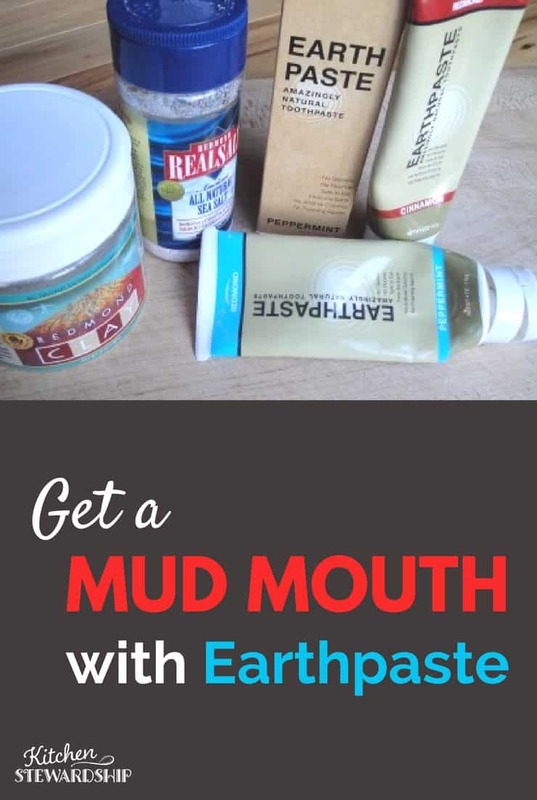 Read more about Earthpaste and check out happy reviews HERE. Earthpaste’s list of ingredients is unique, but the things we left out are just as important. Most brands of toothpaste contain foaming agents like SLS (sodium lauryl sulfate), and chemicals like titanium dioxide to make the paste bright white. Not Earthpaste. It isn’t just safe to swallow — each ingredient in Earthpaste has been used to support healthy systems. Wellness Mama has a great post explaining why charcoal whitens teeth naturally, including a bonus that it changes the pH of the mouth and can help prevent cavities, tooth decay and gingivitis. Just what all the expensive unnatural brands of toothpaste claim! Along with the clay in Earthpowder, charcoal plays a role in remineralizing teeth, and it tastes great (which wouldn’t happen if you just brushed with charcoal). HOWEVER, big note, if you use the charcoal kind of either Earthpowder or Earthpaste (new flavor!!!) you shouldn’t swallow. Charcoal isn’t really a good fit for everyday ingestion, although it helps people kick food poisoning faster and has other fascinating uses, for those who are curious, including applications for bug bites and armpits! Since clay also helps bug bites, I’d totally use this Earthpowder or paste when traveling as a one-stop shop! Next Post » How Do you Make an Easter Basket Without Junk? We love earthpaste! And real salt. I ned to buy some basic clay to add to our medicine chest. What are your thoughts on the Redmond Clay statement: contains trace amounts of lead? Thanks. It has something to do with a California law or some such thing. Like you have to say that if there’s even a chance, or something? “The most important ingredient in Earthpaste is Redmond Clay, a healing clay that has been used medicinally since ancient times. Like many natural foods (including peaches and pears) Redmond Clay contains the tiniest amount of naturally-occurring lead. There is a natural products exemption to prop 65 (otherwise organic green beans and carrots would be 20 times over the limit!) but because of the way proposition 65 is enforced, it would be impossible for a small company like ours to withstand the cost of any “false positives” from aggressive prop 65 law firms. I love how genuine Redmond is – they’re seriously just good people. Does that make sense? We just got the Lemon and my boy is DYING cause I am making him wait to use it till our other toothpaste has run out. I wish I could win this! Calvin loves the lemon. We laugh that it smells like pledge. I have spearmint coming in my next Azure shipment so we can try it. The lemon twist sounds wonderful. Thanks for the giveaway! In the future it would be great for you to add an entry for following you on google+. I don’t tweet or do facebook. Thanks for the discount, Katie! I love all the Redmond products, and being able to buy them at a discount is a huge bonus. Katie, thanks for this giveaway. It’s just in time as I am looking for natural kids toothpaste this week. My four year old daughter is going through a lot with her teeth and I’ve made a lot of changes, but I still need to find a natural toothpaste that she likes. Thank you! I have never heard of or tried this product! I would love to try it as I am always looking for natural healthy ways to improve my family’s lifestyle. I use cinnamon and peppermint Earthpaste. Would like to try the Lemon Twist next. So happy there is a product without all the yucky stuff in it. I would love to try the lemon twist. I’ve tried to create an account on Instagram but it won’t let me. At least I was able to get all of the rest. I’d love to try the Lemon Twist. I’m getting tired of nothing but mint and the chemicals that are in our toothpastes. Is there an expiration on the discount code? Just looking at the budget and timing… 😉 Thanks. I to the the lemon and wintergreen toothpaste because thwy are so unique. I would like to try the wintergreen earthpaste, but the lemon also sounds refershing. I would pick paste in peppermint, cinnamon and wintergreen.